Luxurious enough to grace a mansion. The Optimum is designed to provide many years of enjoyment and fun for your family. The Optimum is versatile enough to fit any yard as a round or oval above ground, semi-inground or full inground pool. 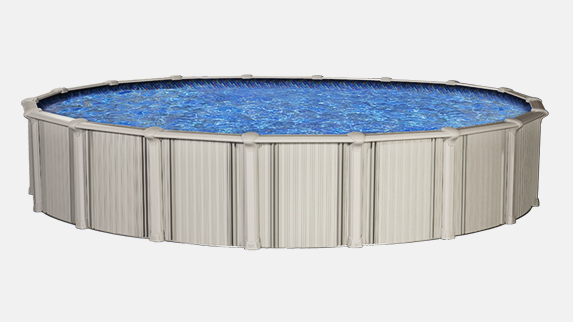 The advanced design on this pool is optimized for compact shipping and easy assembly. The summer is yours to discover with a new refreshing lifestyle...right in your own backyard. Whether you choose an above, semi-inground or inground installation, the Optimum will enhance your home, your backyard, and the pleasure you and your family will find for years to come. There is simply no pool that is as affordable and versatile as the Optimum pool. Not only does the Optimum yield a considerably higher strength than the competition, it is welded with higher grade alloys and standards. It is made strong using aerospace engineering technology and the finest marine grade materials. Designing Spaces gives us a first-hand look at the versatility and ease of installing an Optimum Pool with Paul and Melina Austin of Azle, TX. The couple dreamed of having a pool at home, but they needed one that would accommodate their sloping backyard. Optimum was the perfect solution to meet their needs. 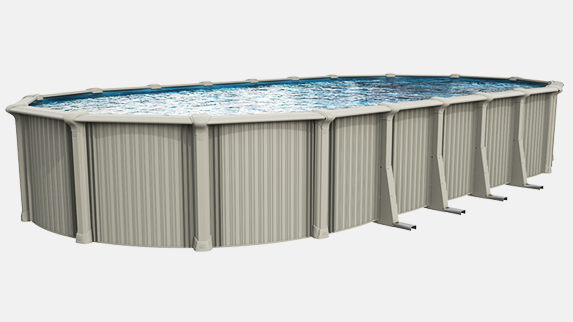 The Oasis oval pool system is available with the Yardmore Buttress free Oval system. This streamlined system was designed to use less space in your backyard. A structurally simplified design with the superior strength and durability of our traditional construction that is both efficient and attractive. 5 full years then 35% off parts lifetime.